Staff members need to be 21 or older. We are accepting applications from people living locally or nationally. This is a volunteer position. 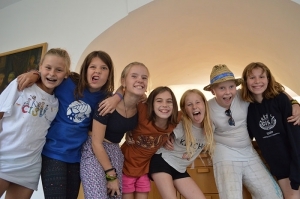 Village is a 4-week international program for 11- year olds from up to 12 different countries. Each delegation consists of four children and an adult leader. Leaders, staff and junior counsellors (JCs) plan programming and activities. Participants eat meals together and share lodging. This life-changing program builds cross-cultural friendship while teaching empathy and leadership skills. Staff members collaborate with three other staff members, led by a camp director, who help lead and inspire peace education activities for a group of 48 camp attendees, their adult leaders and six junior counsellors (aged 16-17). The group will take a “learning by doing” approach to dive deeply into this year’s CISV theme of “Conflict and Resolution”. Staff members will share food and lodging with camp delegates while managing the logistics of the camp environment. This includes helping coordinate meal planning and liaising with the Village cook. Staff members will be responsible for maintaining the safety and well-being of the camp delegates and identifying if a delegate may be in need of medical care. Staff members will manage petty cash and forms including medical forms and dispense medicine according to doctors’ instructions when necessary. We offer staff full training and support, a fun, supportive, intercultural environment and the opportunity to enhance your CV and develop your personal skills.